This entry was posted in News and Awards, News from Athens, Published work and tagged PAGE AND SPINE. Bookmark the permalink. In 2017, I started a “Why I Write Poetry” series of guest posts. I’ve already received so many, and I hope they keep coming in (details on how to In this post, Sofia Kioroglou, an award-winning poet from Athens, Greece, shares her reasons for writing and publishing poetry. This entry was posted in Interview, Βιβλίο της Σοφίας Κιόρογλου, ΔΙΑΚΡΙΣΕΙΣ/Commendations and Awards, Εκδόσεις Πρόμαχος Ορθοδοξίας, News and Awards, News from Athens. Bookmark the permalink. This entry was posted in News and Awards, News from Athens and tagged COFFEE WITH UNDERHILL. Bookmark the permalink. The English edition of my book ” Literary Journeys to the Holy Land” will be out in June. Thank you all! The English version of the book is slated for publication in June so that readers from all over the world will have the chance to be imbued in the experience! A special thank you to Linda Imbler and Christine Tabaka, Sue Vincent, my wordpress friend Vincent from New Jersey, my friend Jendi from Winning Writers and Anders from Odyssey.pm,Derrick my dear wordpress friend and all my friends from wordpress, twitter and the Holy Land for having been my staunch supporters. This entry was posted in A tribute to the Holy Land, Article by Sofia Kioroglou, News and Awards, News from Athens, Poems inspired by Jerusalem, Published work, Release of my new book by Gramma Publications and tagged News, Publications. Bookmark the permalink. 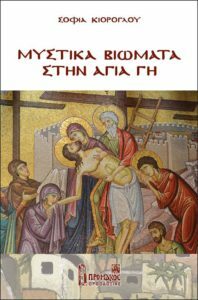 This entry was posted in A tribute to the Holy Land, News and Awards, Published work and tagged Θρησκευτικά, News, Publications, Religious poetry. Bookmark the permalink. This entry was posted in News and Awards, Published work. Bookmark the permalink. Ariel Chart is proud to announce eight writing nominations in two categories for THE BEST OF NET AWARDS. The very best of luck to all nominated. We are grateful for your work and your continued vision in the arts. This entry was posted in News and Awards, Published work and tagged Ariel Chart. Bookmark the permalink. This entry was posted in 2017 BEST OF THE NET NOMINEE, News and Awards and tagged News, Verse-Virtual. Bookmark the permalink. New work coming up to be published March 21, 2018 at Literary Heist. Stay tuned! This entry was posted in Best poems, News and Awards, Personal poems and tagged Literary Heist. Bookmark the permalink. Anyone is welcome to join in this creative adventure! I will be marking the kick off of this poetry adventure then join in. When? February 21st is our Kickoff day. Please visit The Idiotic and Feeble Mindeed Poets Page and join in the fun. This is our chance to link us across the planet. WHAT? There are many ways of doing a RENGA. Since it was through the RENGA that the haiku emerged, ours should be haiku in flavor but without the anxieties of form. There are some who have experience in RENGA and may want to work within a form-that’s ok. But an intuitive 3 line -2 line – 3 line etc is our approach. HOW? The poem will be written in the “say something” field on THE IDIOTIC AND FEEBLE MINDED POETS FACE BOOK PAGE with everyone having an opportunity to contribute. The poem has to be copy and pasted into the field each time in order to add the next link -thus eliminating the previous entry. We ok so far? If you can’t copy and paste message me and I’ll do it for you. If you can’t message me email me at postpublishingworld@gmail.com The last step would be to post your link in the comments so we know who wrote it. It is quite simple. If Facebook wasn’t so clumsy I’m sure there’d be a better approach. WHY? There’s no doubt that THE IDIOTIC AND FEEBLE MINDED POETS is the most unique literary page on Facebook. That’s because of the poets and poetry. The RENGA is a chance to link us across the planet. We don’t have the opportunity to sit down for drinks and dinner and readings-this as close as we can get for the time being. THANKS! We thank you for what will be a creative fun adventure. Feel free to contact us if we can be of help in any way. This entry was posted in Call for submissions, ΔΙΑΚΡΙΣΕΙΣ/Commendations and Awards, News and Awards, News from Athens, Personal poems. Bookmark the permalink. Thank you Marc Pietrzykowski and Catfish McDaris, the editors of the Ramingo’s Porch (Issue #2 – Love, Spring, & Revolution), for publishing my poem along with an interview (many of the poets in this issue #2 have interviews along with their work). Also in this issue are my poet friends: Marianne Szlyk, Rajnishmishravns Varanasi, Ndaba Sibanda, Lynn White and many other talented writers. Welcome to issue number 2 of The Ramingo’s Porch, which is 2 more than any of us thought would emerge from gestation into sunlight–but we received so many fine submissions, the journey proved pretty simple, if not inevitable.